The use of network marketing by an organization as a distribution strategy in its global supply chain management activities is increasing and becoming very popular. This chapter looks at the “new” network marketing-supply chain paradigm, and analyzes some implications of the strategies for effective operations management. The network marketing paradigm has been greatly enhanced by the growth and popularity of the internet, which provides a powerful impetus to the whole concept of effective global network marketing-supply chain management area. This mainly theoretical study also provides a practical perspective by discussing manufacturing and service companies that are implementing the network marketing-supply chain strategy model in some form. It analyzes the supply chain management activities used by these organizations to achieve unprecedented success in their respective industry. 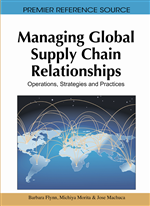 This chapter concludes by developing an effective network marketing-supply chain management model that uses network marketing and supply chain management as key strategies in operations management. Business organizations across the globe have used a variety of network marketing strategies and integrated them into their operations in many creative ways, to achieve great success. Many businesses have effectively used network marketing strategies that network marketing’s reputation, and the popularity of such strategies has grown rapidly in the world over the last several decades. Recently, Warren Buffet’s Berkshire Hathaway company got into network marketing when it bought The Pampered Chef, a leading network marketing company. Southern Living at Home, another successful network marketing leader in the home decorating industry, generated more than $100 million a year for AOL Time Warner, its parent company at the time (Woodburn, 2003). Network marketing has extended beyond the U.S. shores, and other countries have begun to take a close look at this “new” phenomenon. This American-style network marketing model has been referred to as the “new” paradigm which is being experimented with and implemented by many businesses and other organizational structures in Japan (Imura, 2004). In China, the world’s biggest market, several companies and many local people are getting into network marketing (Rayasam, 2007). In a recent study, Coyne, Clifford, and Dye (2007) suggested 21 questions that effective companies need to ask, in developing new products. These include specific questions related to buyers and users (knowing the target market and audience well; examining in depth some of the binding constraints (overcoming limitations); exploring unexpected successes (looking at new creative and imaginative uses for the products); moving toward perfection by imagining it (continuous improvement); focusing on and adapting to the external environment (“thinking outside the box” strategies); and taking a closer look at and revisiting products’ strengths and weaknesses, opportunities, and threats (mission and vision perspectives). This chapter focuses on a few of the specific questions that leading companies are addressing effectively via specific strategies which have contributed to their success – namely network marketing and supply chain management.